oh, sweet joy! : ummm, yes. Read the titles & giggle. I'll have one of each, please. Don't mess with Texas. Amen. Texas is on our list of places we'd love to live someday. I've actually only been to their airport... but anywhere warmer than Minnesota sounds perfect to me! Those are awesome! We moved from Texas this summer too Japan.....I MISS TEXAS! 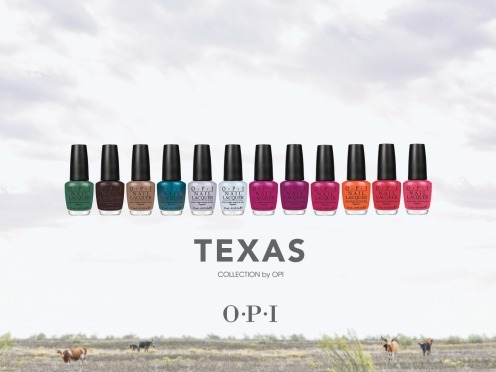 Whoop for OPI realizing the wonderfulness that is the great Lone Star State! I'm right with you on wanting one of each! totally would be wearing "ya'll come back ya hear" & "suzi loves cowboys"
i felt the same way when i saw these today!! love 'em!! oooh, very nice! love the Don't Mess With OPI green! hahah love this! the names are super creative - and of cousre, you know my own obsession with nailpolish esp OPI! heehee love this! I'm actually in Texas right now with Chick-fil-A, and so far--I'm loving it! one of each too please. Oh my goodness that is soooo cute! Yay for Texas love! The Big Hair, Big Nails has my name written all over it. a winner, a sale, and some exciting news! my little sunshine fabric giveaway winner!